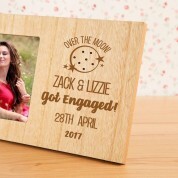 Over the moon about a special couples engagement? 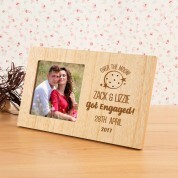 Our wonderful rustic effect frame adds a personal touch to any home, and proudly displays the exciting news in style! The frame is laser engraved by us with a cute design, featuring an outline of a full moon with an arch of writing reading “over the moon”. The couples names feature above “got engaged” and there is even space for the special date. They will love such a personal present, and it makes a lovely addition to a new love nest, too. Our professionals work in house to carefully engrave onto the wood for unique results every time. The frame features a small square photo window - perfect for an Instagram snap of her new bling!